Le Spectre de la Rose. Art Photography, Poetry, Music, Art. This picture had its origins in the sight of a freshly painted blue boat on the shores of Lake Bolsena which reminded me of a painting by Carl Moll, a mysterious, unsettling picture of a blue boat in a flooded wood. I had to ‘borrow’ the boat for the shoot, towing it into position between the trees. I needed a full moon between the trees and it had to be tethered between them. Luckily I did not have to wait long for the moon, but one vital ingredient was missing: the model. However, one day in mid-August Linda from Hungary walked into my gallery. She looked attentively at all my pictures on the wall so I asked if she would like to take part. She said she would be delighted and two days later we were waiting for moon rise over Bolsena. The title “Spectre de la rose” comes from a poem by Théophil Gautier, Berlioz’s friend and neighbour. It is one of a cycle of six called “Les nuits d’été”. The poem is unusual in that it is written from the rose’s point of view, and the ghost of a rose at that. and dance at your bedside. Set to music by Berlioz, it is beautifully languorous, the quintessence of Mid-Nineteenth Century Romanticism. Four of the songs in “Les nuits d’été” including “Spectre de la rose” are sombre and tell of romantic longing whilst the first and last quite up-lifting. The image of Linda, arms outstretched, looking across the lake, is oneiric, dreamlike. Water in dreams is a female element and represents birth while the boat usually suggests the resolution of seemingly intractable problems, as well as the more obvious journeying. Linda the twenty-one year old student had been doing an unpaid board and lodging summer job in Italy, the way I too had started out in Italy 35 years ago. She was uncertain about her future and what path to follow. Dissatisfied with landlocked Hungary, she has taken the boat and set off on her voyage, she is now in Paris; I suppose I am the ghost of the rose. 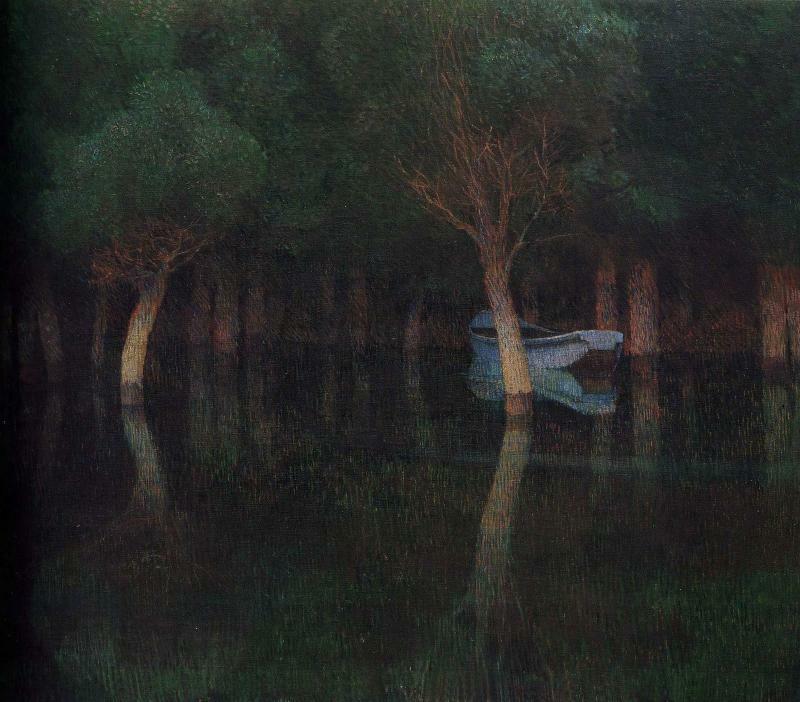 Carl Moll was friend and colleague of Klimt as well as a founder member of the Secession. He was Alma Schindler’s stepfather, she later married Gustav Mahler and notwithstanding two Jewish husbands and a half-jewish daughter, manifested an unrepentant anti-semitism typical of the time. The Vienna of those days was a maelstrom of psychological, artistic, cultural and political currents unique in world history, but the tragedy of 1914 was to destroy the fin de siècle euphoria along with millions of lives; after the war Moll became an enthusiastic Nazi and committed suicide with his daughter, Alma’s half-sister Maria, when the Russians entered Vienna in 1945. His blue boat had drifted from twilight into the heart of darkness. Et j’arrive du du paradis. For more about the making of this image visit the blog post The inspiration behind art photography. Le Spectre de la Rose.